HomeWhen Do You Stop Leading? When Do You Stop Leading? It is hard to consider it when you are the leader, so my default process has always been to remember my thoughts and feelings when I can observe as a follower. The influences other leaders, perhaps old bosses, had on you are as valuable as your own leadership experience… I include the negative examples as well as the positive. If you ever said to yourself “What were they thinking when they said/did/wrote that?”, you hopefully learned from “their” mistakes. Every inappropriate comment or joke, snide remark, or act of entitlement will be judged by others even if there is never a comment. So, when does it end? It made me think about all the times I observed actions I admired and actions I detested in other leaders. The positive actions, I thought over and remembered for the future. The negative behavior I made the point to remember as deeds to never repeat in the future. But, I would also think to myself: how long would I put up with that person before I left? Workplace relationships are complicated, but it really comes down to the accumulation of plus and minus judgements that drives your perception. Obviously, there are actions that are more egregious than others and more likely to create a toxic atmosphere. So, knowing that I judge others, I can assume that the picture pivots and others judge me, especially when in the spotlight of a leadership role. Drivers – the psychological and social cognitive bias that are the foundation of thinking. Critical Thinking Skills – understanding the drivers and evaluating evidence in an unbiased manner. Culture – creating a healthy organizational culture to breed cohesion and evade discord. Leadership in uncertainty – guiding others during periods of crisis when time and information are in short supply. Managers need to develop skills in each of these areas to prepare themselves as leaders. As a leader, each of these principles will have a role in your success or failure. Drivers – You need to make the effort to comprehend people and their personal and social biases. In that way you can understand what motivates them. Without this appreciation, you will never gain their loyalty. There is an initial investment in time to study how people learn and remember information and how to use inherent social behaviors to motivate groups. In a transactional situation, maybe it isn’t critical, but you will not be able to optimize the performance of your people. On the other hand, well-motivated teams always perform beyond expectations motivated by working to the benefit of the group. Critical Thinking Skills – In the same way it takes initial effort to learn drivers, it takes time to learn critical thinking skills and how to apply them. But, since evaluating evidence is used every day in decision making, critical thinking skills will be used weekly, but the impact of good decisions will have a long-term, positive effect. Culture – Building a good, healthy organizational culture is an ongoing process. It is the difference between working for a paycheck and looking forward to coming to work. In the worst case, the culture is cliquish, overly competitive, and discriminatory. In the best case, the culture can empower employees to learn and grow. The behavior of the leadership (good or bad) trickles down to subordinate leaders and, finally, to the rank and file. Culture building is how the leadership and the company is perceived every day and how they are judged. Uncertainty – in periods of uncertainty, employees will look to leadership for guidance and direction. Uncertainty can be caused by external forces (such as natural disaster, market crash, industrial accidents, etc) or through internal forces (such as reorganization, too much success (growth outpacing capacity) or bankruptcy. The drivers create limits in time and probably money. The leadership will need the trust and confidence of the employees, so that the staff does not panic and leave. The upfront investment for actions is contingency planning, but trust must be earned long before a crisis hits the organization. Which is the most important principle? I would not suggest that any one principle is more important, they are all intertwined. Understanding drivers, the social and psychological biases, help not only in motivating others, but in learning about your own bias. A personal cognition of your own biases is important to developing critical thinking skills. Good decisions based on evidence-based critical thinking and positive motivations will contribute to a healthy organizational culture. A healthy culture will build trust and confidence in the leadership during periods of uncertainty and crisis. When the crisis has passed, success can be used to support motivation and improve group cohesion. The best friends are those who face adversity and so a crisis, well managed, can reinforce an even healthier culture. As I said, no single principle is more important than the other, each is needed in its own time. 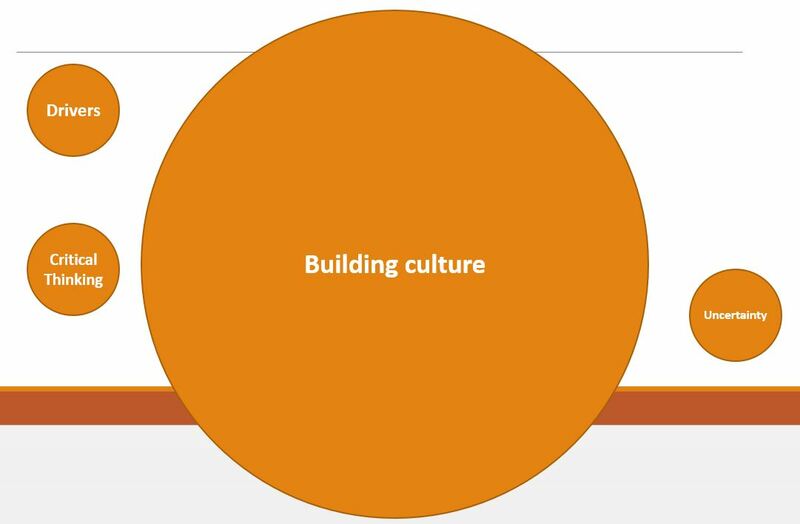 I think what is true is that on a daily basis, the most often practiced principle will be culture building. Each of the four principles of leadership Drivers, Critical Thinking, Healthy Culture, and Uncertainty Leadership are important to being a good, effective leader. Mastery of Drivers and Critical Thinking require an upfront investment of time and study. The fields are finite and learnable, the benefits are long-term. Understanding uncertainty and how to lead through times of crisis requires planning and then the trust of your subordinates. The planning scenarios can be reviewed, rehearsed, and ready when the time comes. The point I want to make is that of all the principles, it is building a healthy culture that will be some part of every day. It will be in how you respond to individuals (or not). It will be how you respond to a group (or not). As a leader, everything you do will contribute to the health or detriment of the culture you control. How you respond to social situations, both directly or indirectly, is how your subordinates will perceive your values. Are the building and offices clean and hygienic? Do you speak to others? Do you allow negative people to bring the group down? Are there sufficient resources and training? As you create your own toolbox for leadership, culture building is the broadest and the most diverse set of tools and actions. A healthy organizational culture is what will be noticed every day. The lack of a healthy culture will also be noticed every day. The biggest differences will be in which of the cultures people will stay the longest, in which culture has fewer negative HR problems. There is more to learn in developing a healthy culture because the process is diverse. But, as it is performed a little each day the influence is accumulative. Guide the healthy culture by understanding what motivates your personnel and by using critical thinking to set policy decisions. To answer the original question, you never stop leading. Everyone will always judge you on what you say and your actions; and what you don’t say and your inactions. So, my advice is to make organizational health your mantra. Although I mention specifics in the list above, culture can be created in generalities: play nice together, help the other person, offer respect, and ask what is good for the group? ← Power – How to be a Cult Leader in 5 Easy Steps!